42 | TH E M R EP O RT O R I G I NAT I O N S E R V I C I N G DATA G O V E R N M E N T S E C O N DA R Y M A R K E T ORIGINATION THE LATEST HARP Refis Low Heading into Final Year Only 2 percent of all recent refinances were done through the program. F or the third quarter of 2016, GSE-backed mort- gages refinanced through the Federal Housing Finance Agency's Home Afford- able Refinance Program (HARP) represented only 2 percent of all refi volume, only a fraction of its peak of 27 percent in Q2 2012. In October, the share of refis completed through HARP as a percentage of total refis did not improve as the program heads into its final year. Approximately 3,900 refinances were completed through HARP during the month, repre - senting approximately 2 percent of total GSE refi volume, according to the FHFA's Refinance Report for October 2016. In October, HARP refis were on a pace to equal their Q 3 total of close to 16,000, according to FHFA. In all, 3,438,437 refinances have been completed through HARP since the program's incep - tion in April 2009. HARP numbers have been shrinking since the third quar- ter of 2012, when they peaked at 319,000 for the three-month period. Total HARP refi volume topped 200,000 each quarter from Q2 2012 through Q 3 2013, accord - ing to FHFA. Originally set to expire at the end of 2013, HARP's expiration date was extended to the end of 2015, then the end of 2016. In August 2016, HARP was ex - tended until September 2017. To be eligible for HARP, borrowers must have a loan owned or guar- anteed by Fannie Mae or Freddie Mac, have a loan originated on or before May 31, 2009, have a current LTV of greater than 80 percent, and be current on mortgage payments at the time of the refinance. Borrowers are al - lowed one late payment in the 12 months prior to the refinance as long as it did not occur in during the six-month period before the refinance. FHFA estimates these borrowers save an average of approximately $2,400 per year on mortgage payments. FHFA has made attempts to reach borrowers eligible for HARP through a series of outreach events in cities with the most eligible borrowers (Chicago, Atlanta, Detroit, Miami, Newark, and Phoenix), as well as through webinars, websites, and social media campaigns. Approximately 4 percent of the loans refinanced through HARP in October had an LTV ratio of greater than 125 percent, according to FHFA. 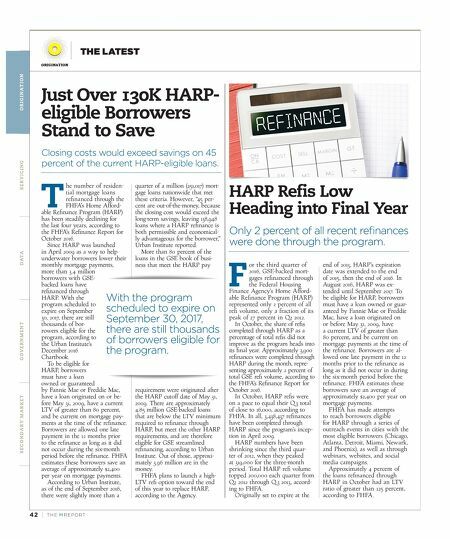 Just Over 130K HARP- eligible Borrowers Stand to Save Closing costs would exceed savings on 45 percent of the current HARP-eligible loans. T he number of residen- tial mortgage loans refinanced through the FHFA's Home Afford- able Refinance Program (HARP) has been steadily declining for the last four years, according to the FHFA's Refinance Report for October 2016. Since HARP was launched in April 2009 as a way to help underwater borrowers lower their monthly mortgage payments, more than 3.4 million borrowers with GSE- backed loans have refinanced through HARP. With the program scheduled to expire on September 30, 2017, there are still thousands of bor - rowers eligible for the program, according to the Urban Institute's December 2016 Chartbook. To be eligible for HARP, borrowers must have a loan owned or guaranteed by Fannie Mae or Freddie Mac, have a loan originated on or be - fore May 31, 2009, have a current LTV of greater than 80 percent, and be current on mortgage pay- ments at the time of the refinance. Borrowers are allowed one late payment in the 12 months prior to the refinance as long as it did not occur during the six-month period before the refinance. FHFA estimates these borrowers save an average of approximately $2,400 per year on mortgage payments. According to Urban Institute, as of the end of September 2016, there were slightly more than a quarter of a million (251,017) mort - gage loans nationwide that met these criteria. However, "45 per- cent are out-of-the-money, because the closing cost would exceed the long-term savings, leaving 138,948 loans where a HARP refinance is both permissible and economical - ly advantageous for the borrower," Urban Institute reported. More than 80 percent of the loans in the GSE book of busi - ness that meet the HARP pay requirement were originated after the HARP cutoff date of May 31, 2009. There are approximately 4.85 million GSE-backed loans that are below the LTV minimum required to refinance through HARP, but meet the other HARP requirements, and are therefore eligible for GSE streamlined refinancing, according to Urban Institute. Out of those, approxi - mately 3.96 million are in the money. 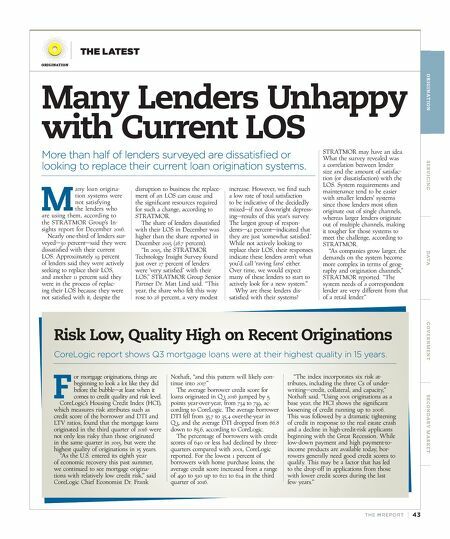 FHFA plans to launch a high- LTV refi option toward the end of this year to replace HARP, according to the Agency. With the program scheduled to expire on September 30, 2017, there are still thousands of borrowers eligible for the program.